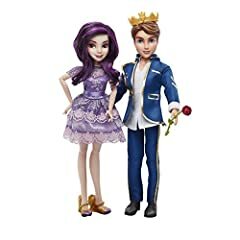 Malefacent's daughter, Mal and Ben, the crown prince son of Beast & Belle - together these Disney Descendants dolls make a nice gift for any Disney, Barbie, Doll, lover. Mal looks very much like her real life counterpart - her dress is a gorgeous shade of purple, which goes great with her purple streaked hair. Speaking of the hair, I thought it was cute, a "teen" style, but my granddaughter wasn't so fond of it. She enjoys combing and fixing the dolls hair, and this cut limits what can be done with it. The lace work is beautiful and well done, with no double stitches or loose strings. Her shoes are high wedges and are easily removed and replaced. Mal is an attractive character, with a gorgeous painted face and a delicate, friendly smile. Ben ... the crown prince, son of the beautiful Belle and handsome Ex-Beast isn't so well put together. His outfit is beastly. It actually looks like the torn, worn, too small outfit made famous by Beast in the original Disney movie. Maybe that was the intention. If so, they nailed it. If not, he's a real mess - looking cheapy instead of princely. The rose is a sweet touch - but we spend a lot of time looking for it, because it falls out of his hand. Like his friend, Mal, his shoes are easy on/easy off and look nice. His face is nicely painted, with a kind smile and beautiful, bright blue eyes. Oh, the 80's fake, plastic hair. I was shocked when we opened the box and saw his hair. (Of course, she hated it!) And her dislike deepened when we discovered it is impossible to keep his crown on his head once the rubber packing band is removed. So, if you want to keep the crown on his head DO NOT remove that small band. All in all this is a nice set, pretty to look at, fun to play with and there are many other dolls available, characters tied to movies we have all loved for years. It's very reasonably priced at the current 23.99$ - so, if you're looking for holiday gifts this is a sound choice for the Disney darling on your list.